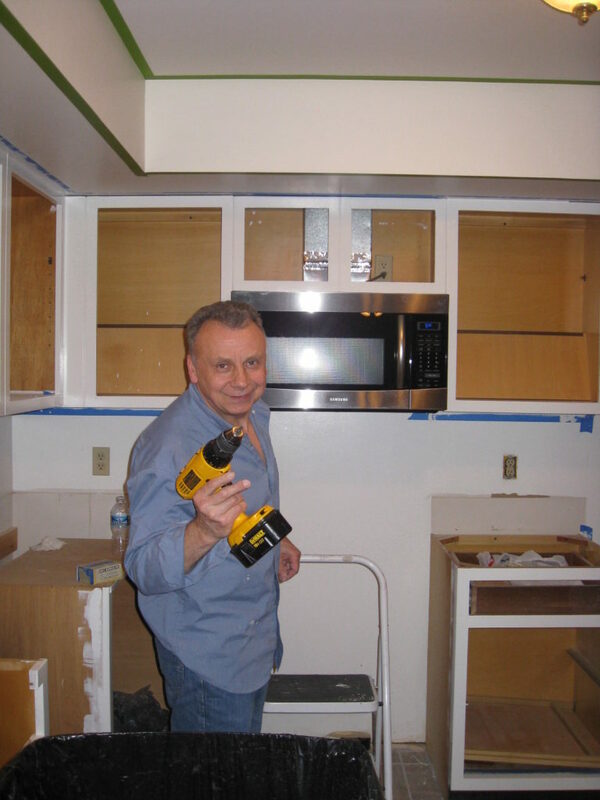 Home Home Life Decor How to Paint Kitchen Cabinets so They Last – This Method Works! 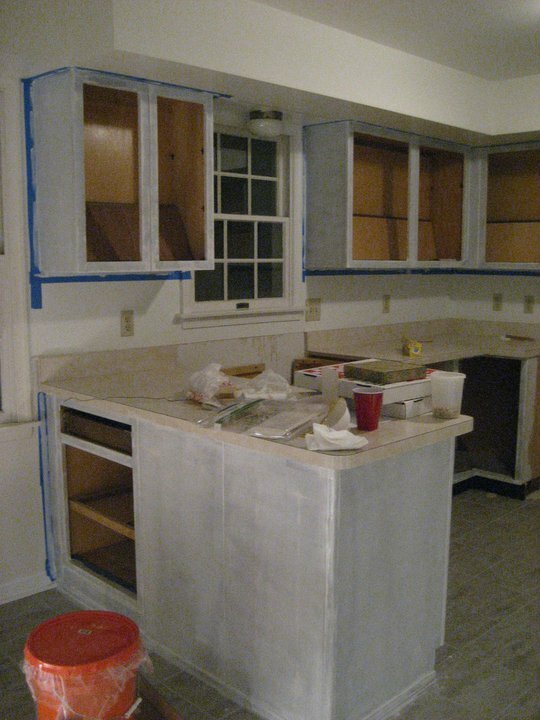 Want to know how to paint your kitchen cabinets and have them look just as good many years from now? Then I have the method for you. Eight years later, our kitchen cabinets look just as good as when we first painted them. No joke. This method works and is long lasting. It has survived two crazy boys, a husband, a dog, numerous holiday baking marathons, and daily meals. 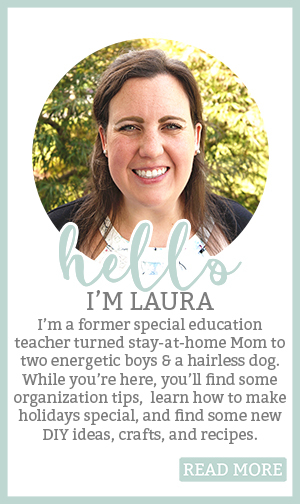 Our kitchen is heavily used because my husband works from home and I am a stay at home Mom. 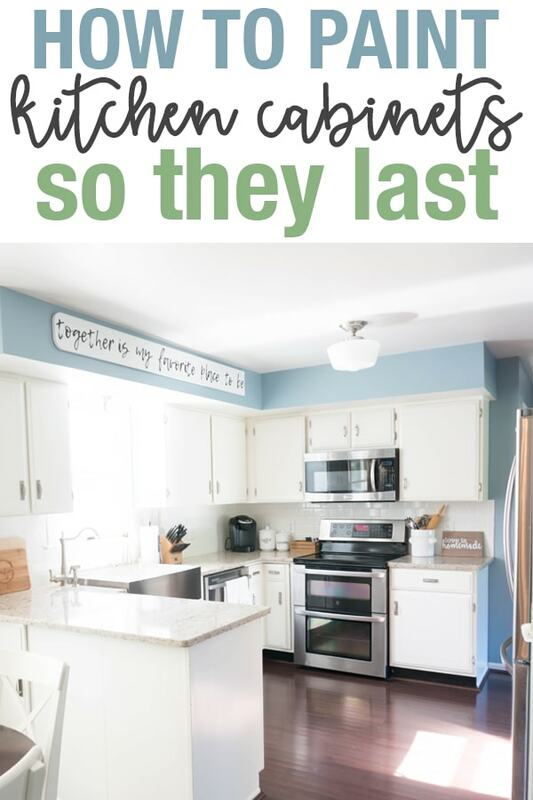 We live in our kitchen – the boys are always in there helping me make something, running their trucks into the cabinets, or leaning a chair against the cabinets so they can sneak on to the counters to get something. A lot of kitchen cabinet posts you read people have just finished their kitchens. While they may have some great information, they haven’t lived in their kitchens yet so it’s unknown whether or not the paint will last. The process of painting cabinets isn’t hard. It’s just a little tedious (the same goes for any method of painting cabinets). Although tedious, it is well worth the time it takes. Even eight years later, I love my cabinets. They look just as good as when I first painted them. One last thing before the directions, I have to apologize up front for the not so wonderful pictures. I wasn’t blogging at the time so my Mom and I just took pictures of the process for memory sake. Needless to say, they are far from perfect. But, they are a real-life example of a renovation process. 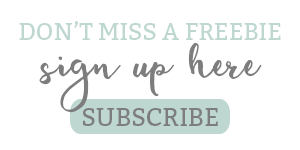 If you missed my first post on our kitchen, don’t forget to check it out! You can find it here. 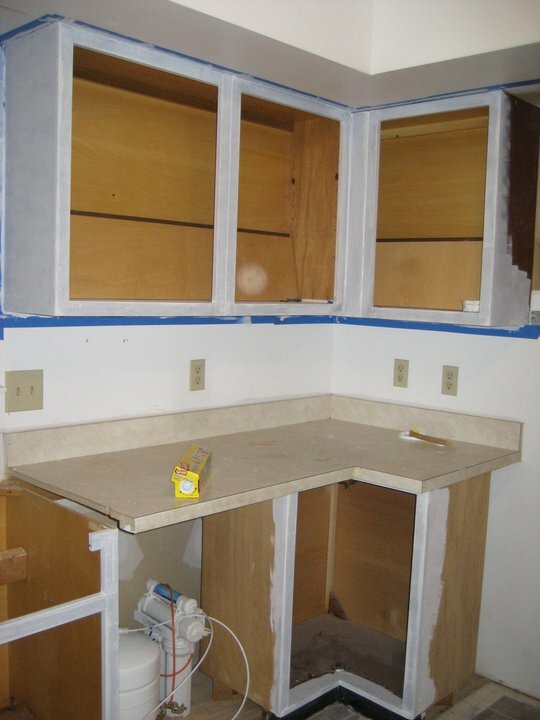 Want to skip the how-to and see the finished cabinets? 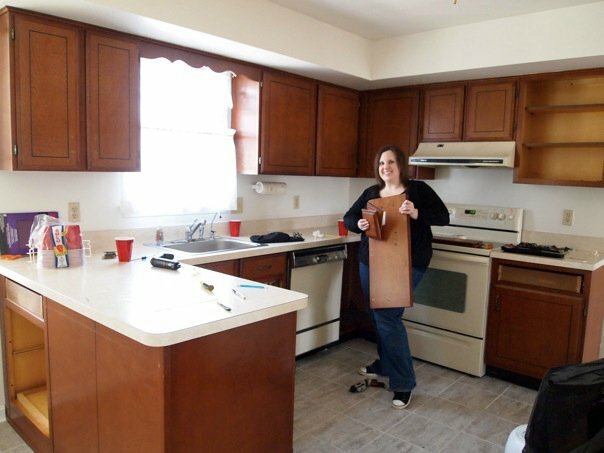 Click here to see our big kitchen reveal! A small and standard size paint roller (I found it much quicker to roll the paint). Wood putty if you want to put on new pulls or knobs that have different hole spacing than the old ones. New handles/knobs and hinges if desired (we replaced mine because they were unattractive). 1. Use oil-based paint. And not the cheap stuff. Why? Latex paint isn’t as strong as oil paint. It can dent and chip much easier than oil-based paint. In a heavily used area, such as a kitchen, it’s important to use a stronger paint that can take some wear and tear. Oil paint cures over time and hardens. It has a thicker coverage and has a smoother finish. Don’t use cheap paint. You get what you pay for. What are the downsides of oil paint? It is stinky. 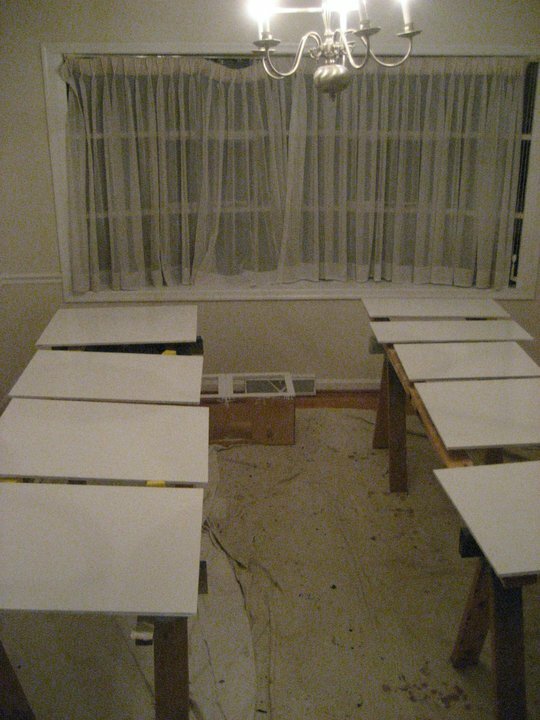 Be prepared to paint with the windows open and if possible, paint the doors in the garage or outside. Clean up is tough. You have to use mineral spirits to clean any paint off of your hands, brushes, etc. 2. Use Penetrol mixed with the oil paint. Why? Penetrol reduces visible brush strokes/roller marks. Why is that important? You want your cabinets to look professionally painted – smooth and free of lines caused by the brush dragging and the roller. 3. 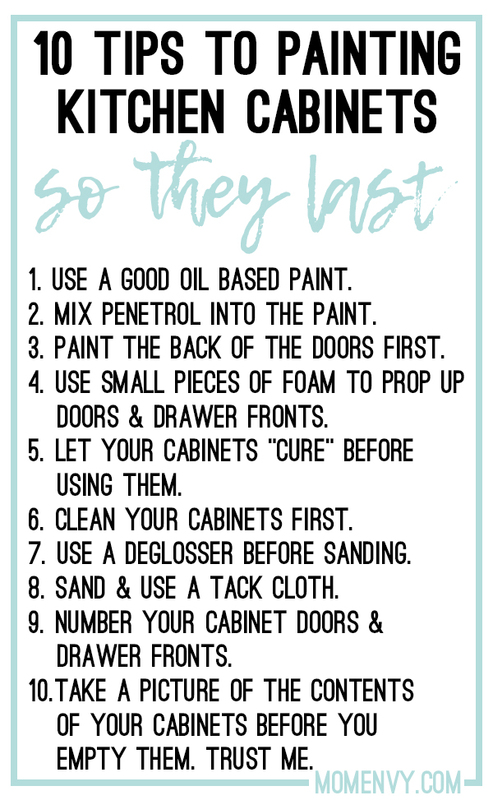 For each coat, paint the backs of the cabinet doors first. Why? Paint the backs of the cabinet doors first. Then flip them over and paint the front. If the paint happens to drip from the back to the front, you can lightly sand the drips off before painting the fronts of the cabinets. I didn’t worry about minor drip marks on the backs of the cabinet doors. 4. Use small pieces of foam, scrap wood, blocks, etc. to prop your cabinet doors up off the surface. Why? 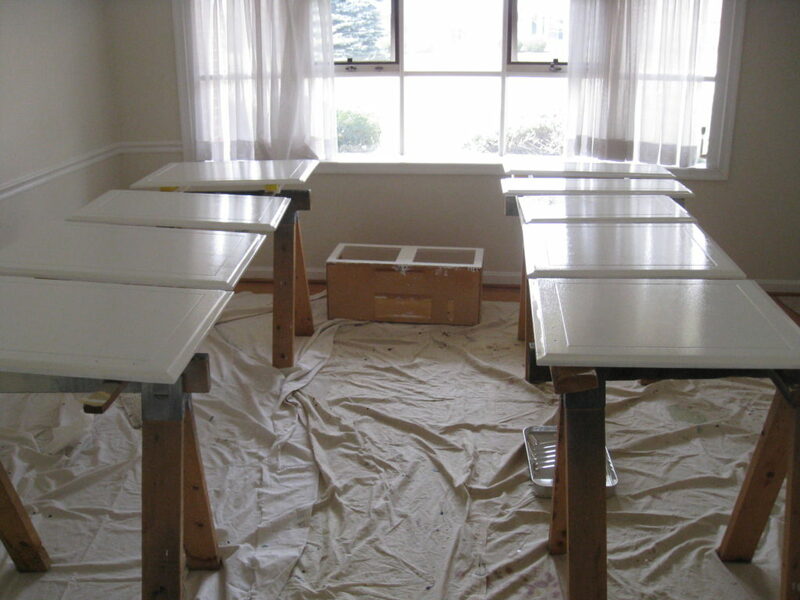 When painting cabinet doors, you want to be able to paint the edges of the cabinets. 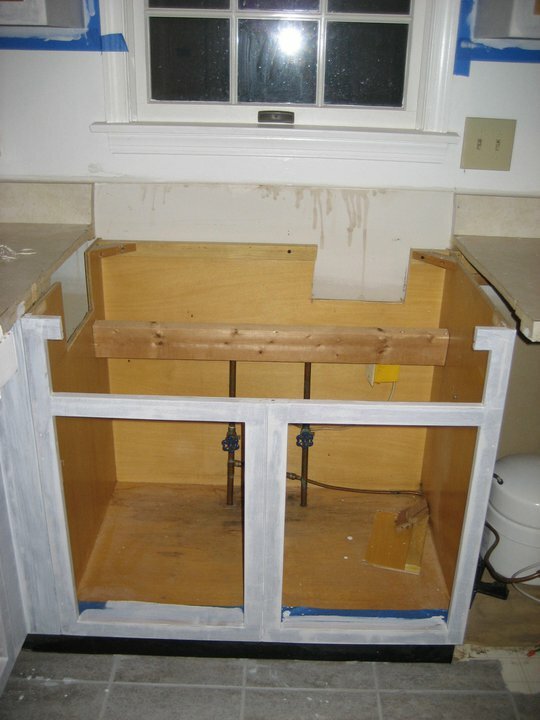 If the cabinet doors are sitting directly on top of a surface, the paint may drip down and pool on the surface causing major drip marks and paint build up. 5. 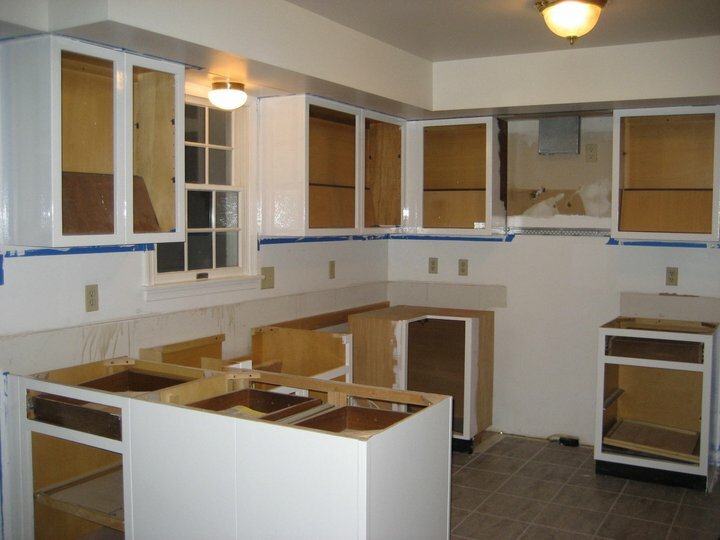 Let your cabinets “cure” before you start using them. Why? 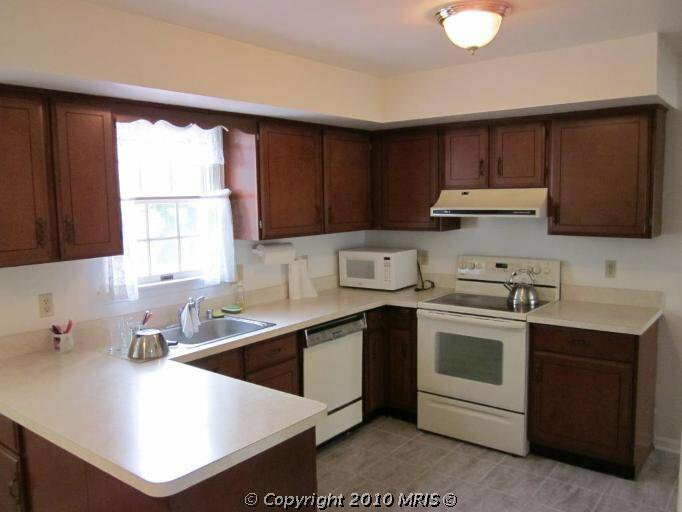 I know, you’ve been without cabinets for weeks. You just want to get your life back to normal again. But don’t do it. Oil paint takes some time to cure. It gets harder as time goes on. It also takes a long time to dry. Don’t accidentally ruin all of the work you just did because you moved your dishes in too soon. 6. Clean your cabinets before you start. Why? 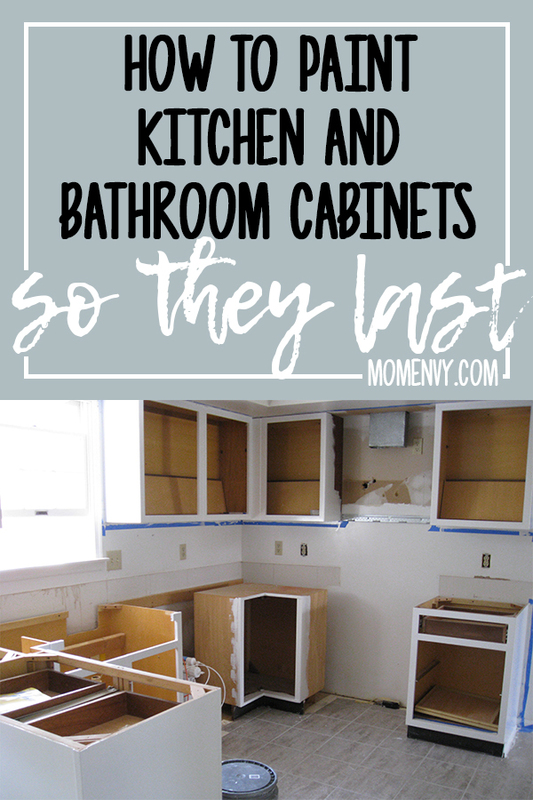 Cabinets get a lot of built-up oil, grease, and dirt on them over the years. Just take a sponge or my favorite, the magic eraser, to clean your cabinets. 7. Use a deglosser before you sand. Why? Cabinets generally have a high gloss finish which can be extremely sticky and will gum up your sandpaper when you go to sand. It’s better to get rid of the glass before you sand. 8. Sand & Use a Tack Cloth after. Why? I know, sanding isn’t fun. But it makes such a difference in the quality of the cabinets you put out. Skipping this step isn’t worth it. A tack cloth picks up the residue from sanding so you paint on a clean surface. 9. Number your cabinet doors and drawer fronts. Why? You don’t want to mix up your doors and drawer fronts. It’s just easier if they go back in the same spot. Trust me. Just use a small piece of painters tape on each with a corresponding number. 10. Take a picture of the contents of your cabinets before you empty them. Why? If you’re comfortable and happy with the way your contents are laid out in your cabinets, you don’t want to waste time trying to remember where everything goes. 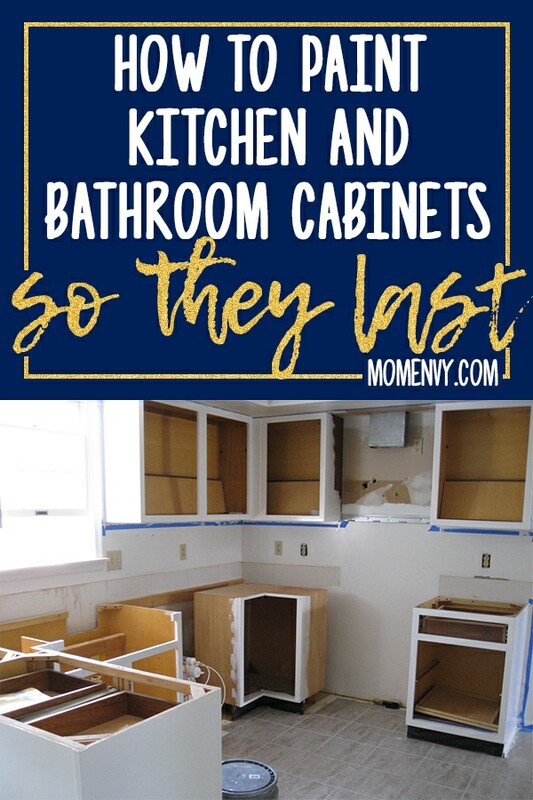 You may think you’ll remember, but after weeks of empty cabinets, you’ll be surprised at how hard it is put everything back in the right place. Step 1: First, take a picture of the contents in your cabinets. Then empty them. Don’t try to keep the contents in your cabinets while you’re painting. If you do, you’ll have to take everything out and clean it from all of the sanding dust and debris. 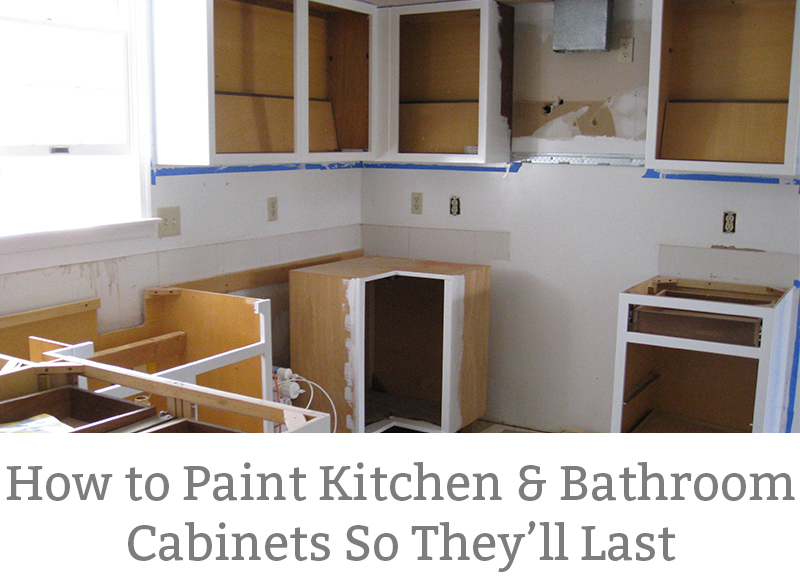 Step 2: Scrub your cabinets. Make sure they are clean and free of food residue and oil. Step 3: Prep the space. 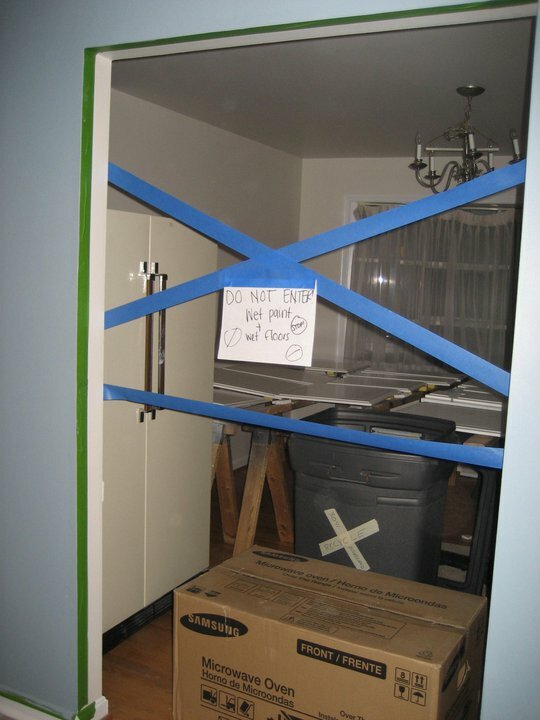 Place painters tape where needed (such as at the ceiling and floor). Place drop cloths on the floor. Use plastic sheeting and tape to cover the counters and appliances (I didn’t use drop clothes because we were replacing the flooring, counters, and we had no appliances). Step 4: Place a small piece of painters tape on the inside of each cabinet with a number. Then, place a small piece of painters tape on the door or drawer front you are going to be removing. Trust me. Step 5: Remove all of the door, drawer fronts, and hardware. In our kitchen, we also removed the scallop trim above the sink. 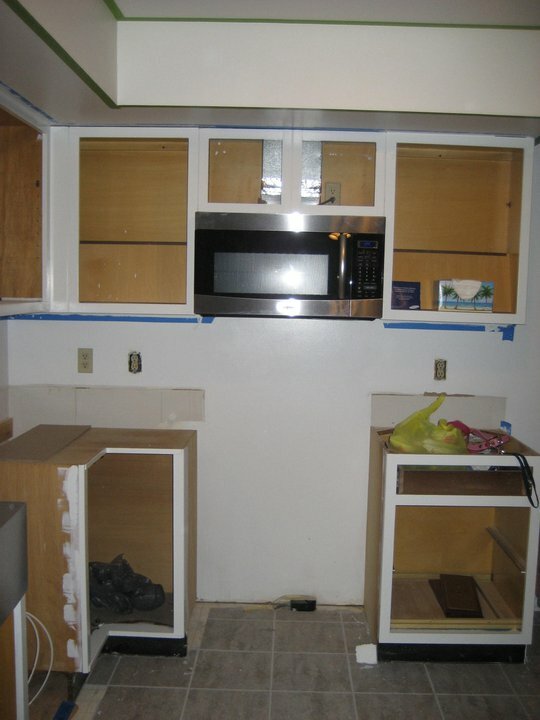 If you’re modifying any cabinets (such as the one above the stove), remove the cabinet you’re modifying. 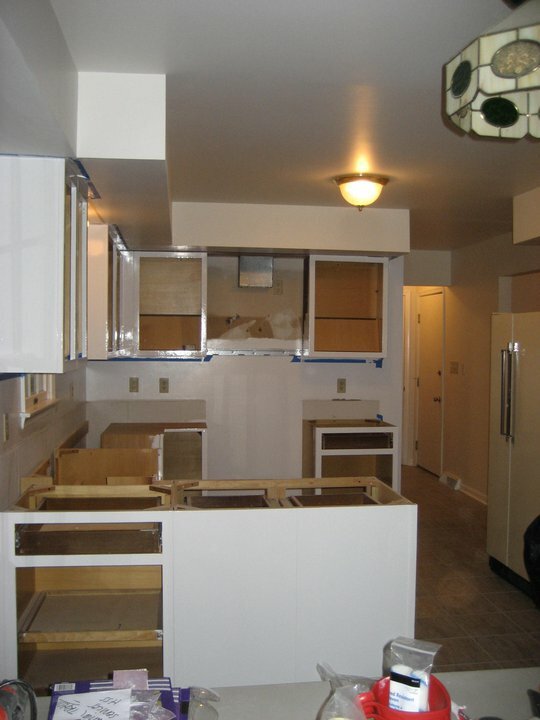 If you’re replacing the counters or appliances, remove them now. It will be so much easier. 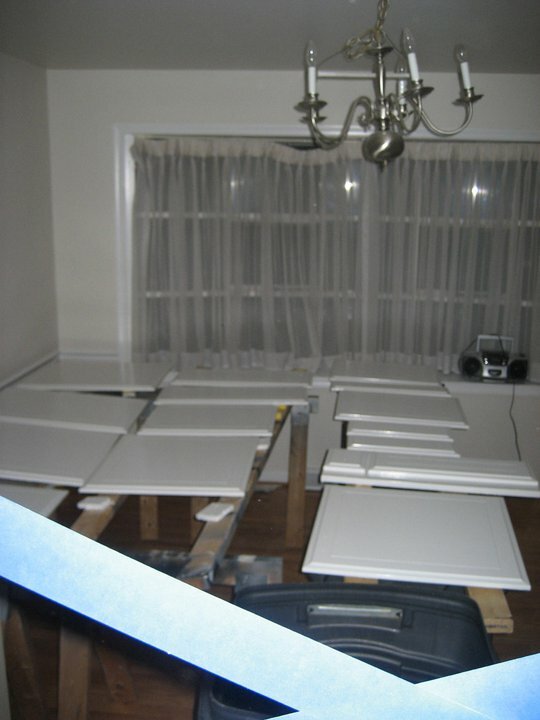 Step 6: Then lay out all of your cabinet doors in an area they can be housed while painting them. I used my living room. We took saw horses and laid two eight foot 2 x 4s across them to create a “table” type surface. Use small pieces of something such as Styrofoam to prop the doors up off of the surface. This was our cabinet door set up. You can see the small yellow pieces of foam we used underneath. What you can’t make out in this picture are the small post it’s on the 2 x 4’s with the door/drawer front number. Step 7: Remove the number from the door or drawer front and place it on the one of the 8 foot 2 x 4s just below the door/drawer front. This way you will remember which cabinet door or drawer front so that you can place it back on correctly. Step 8: De-gloss all of the cabinet surfaces and doors using a cloth. Step 9: If you are going to use hardware or hinges that have different hole spacing, use wood putty to fill the holes in the cabinets. Let the putty dry. Step 10: Next, sand all of the cabinets and doors with 120 grit sandpaper. Step 11: Go over all of the surfaces with a tack cloth to make sure there is no residue left behind. Step 12: Mix Penetrol in with the paint. Stir well. 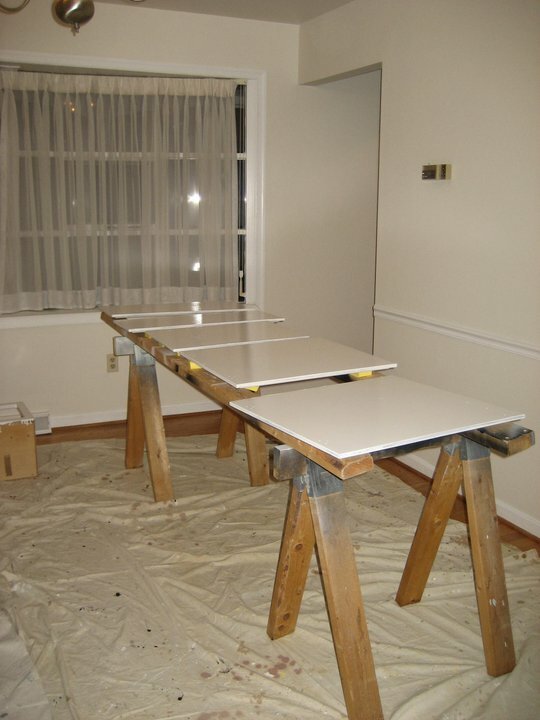 Step 13: Paint one coat of paint on all surfaces using a brush and/or roller. Paint the back side of the cabinet doors. I preferred the rollers for the large areas such as doors and then I used the brush to cut in and do small spaces. 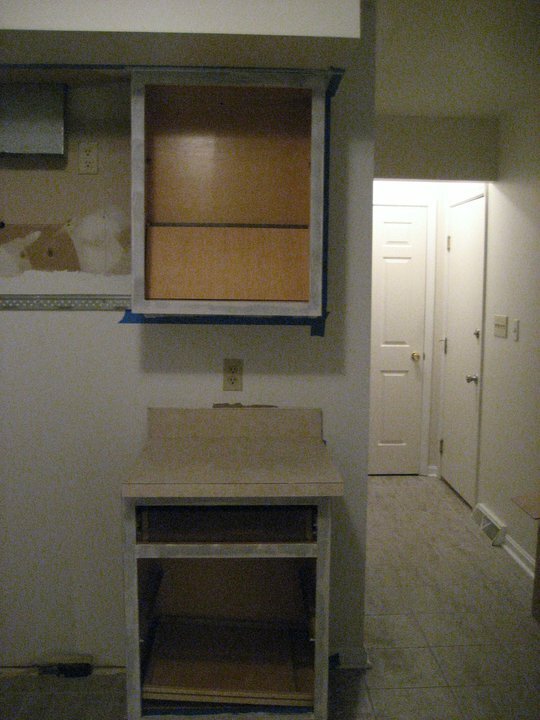 Step 14: Next, flip the cabinet doors and drawer fronts over and paint the front. This base cabinet had to be cut to accommodate my new sink. Step 15: Then Repeat steps 13 & 14. If your paint is starting to show more brush strokes or roller lines, add a little more penetrol. This is how I tried to protect my cabinet doors while they were curing. We had our floors being put in and I was worried someone would hit the freshly painted doors and drawer fronts. Step 17: Lastly, assemble everything back together (including drilling new holes for handles/hinges if needed). I’ll share in another post how my Dad was able to cut the cabinet above the stove so that it could hold a microwave. **Before filling our cabinets, we let them cure another week longer. 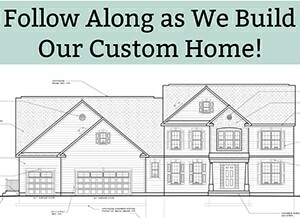 Ready to see the finished cabinets? 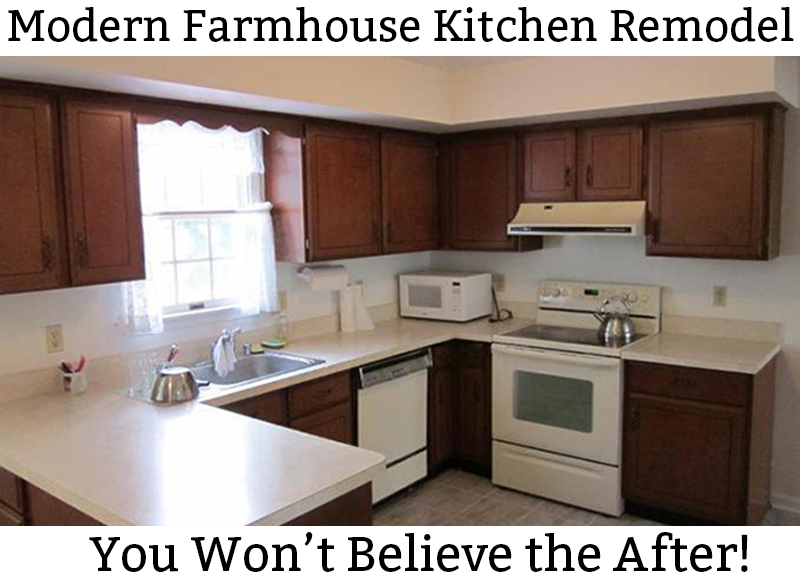 Click here to see our big kitchen reveal! 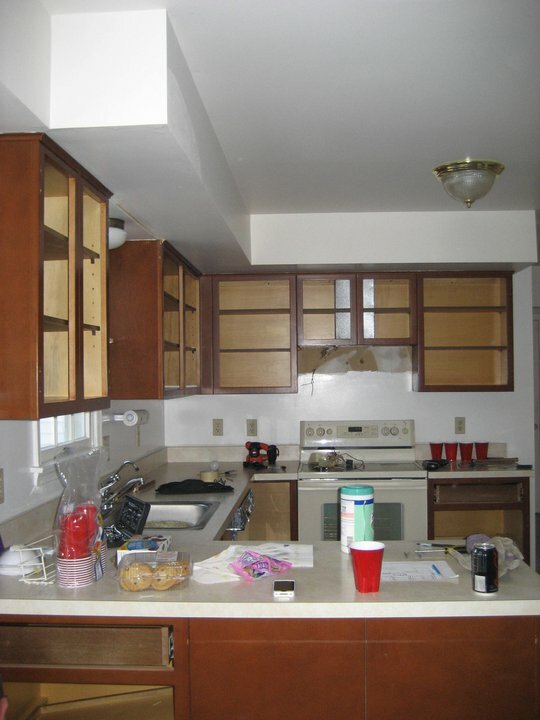 Have you not had any issues with “yellowing” using the oil based paint on your cabinets? I have heard that all oil based paints will eventually yellow and that makes me nervous! 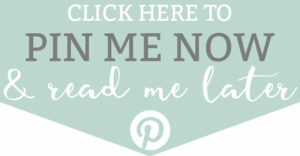 I just discovered this post and it has given me the courage to think I can do this in my kitchen! Can you tell me the Sherwin Williams color you used? Hi Anne! That’s great – give it a try. It really isn’t difficult (just takes a little time). I went and looked and I don’t have the paint can anymore so I am not sure of the color. But it was one of the more popular bright whites they sell (I asked for a popular white – figuring that whatever is popular would probably be something I would like as well :)). What do you is to degloss? Any tips for painting the cabinet frames (not sure if that’s what it’s called, but the part that you are unhinging the cabinet from)? You can purchase a deglosser at any home improvement store. It’s actually really easy – you take a soft, clean rag and get a little deglosser on it and scrub the cabinets (making sure you don’t miss any spots). You’ll start to see the top layer of varnish come off. To pain the frames, I placed them on top of long strips of wood to keep them elevated (so that I could get the edges). I painted the backs first, sanded any drip marks, and then flipped them and painted the fronts. I used a paint brush on mine to get in the little lines and then rolled the rest. Hope this helps! Where do you buy the oil based paint. I live in California and they do not sell oil based paint here. Oh no! I didn’t realize that they no longer sell oil-based paint there. Since I painted my cabinets, both chalk paint and milk paint have come out. 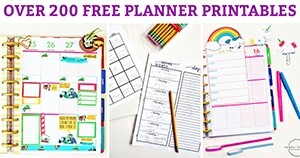 I think if I were to do them today and couldn’t use oil based paint, I would use chalk paint. But, I would make sure to seal them with something other than wax so that they would hold up better. Chalk paint chips after a year or so in my experience. I am now looking at Advance by Benjamin Moore, especially for cabinets. That’s good to know, that’s for the information! I really had such great luck with the oil-based paint. It’s a little more annoying dealing with the cleanup but the hard, strong finish it provides is well worth it.